Boy, I love the Science Fiction And Fantasy Facebook thread! The people there give me a wealth of inspiration. Recently, someone started a thread and asked how people felt about having characters versus scenes (or other designs) on their book covers. In this context, they were referring to mainly fantasy and science fiction. I think that particular author is fantasy, if I remember correctly. I’ve talked about covers before, how important they are, how I personally feel about them, and how they can influence your book sales. Now, let’s look at both sides of the coin. A great artist may be able to bring your character to life. If your main character is very good looking, or is an alien creature or fantastical beast, that image fills in the blanks for the reader. They see that image on the cover and picture him, her or it throughout the story. If, the rest of the artwork accompanying the image fits with that image, you may have a flashy cover that gives the reader a vivid idea of a particular scene in the story. That can be a great way to sell a book. Ninety-nine percent of the time, not only does the character on the cover not look anything like the main character, but the scene depicted has nothing to do with any scene in the story! Let me repeat that. Ninety-nine percent of the time, not only does the character on the cover not look anything like the main character, but the scene depicted has nothing to do with any scene in the story! It’s a well-known fact that publishers give their work over to cover artists and it’s up to these artists to “interpret” the story and come up with a cover. So, the artist does just that. They “interpret” their impression of something in the story, which hardly ever corresponds to an actual event in said story. That includes the actual main character. It is usually a composite at best. The author rarely, if at all, has any input whatsoever, even if given “token” input. Therefore, though the artwork may be super fantastic, it rarely has anything to do with the actual story. It might be “close enough for guv’mint work,” but if the reader gets the impression that that cover depicts an actual scene in the book, they may read and read and read, searching for that particular scene, only to be disappointed. Because I’ve done it countless times! I’ve seen a cover, read the book and come away disappointed. What about self-published authors? Do they have more control over their artwork? That’s an interesting question because maybe they do. However, in this case, since they have to fork out all the cash themselves, they have more of a budget and as a result, many many self-published works have a bad rep for less than stellar covers. Do you want your reader to get the picture of a heroine that looks like Marty Feldman who’s supposed to be a female warrior out of their mind? Now, for the other part of the bad, why force an image on your readers? Why force them to see any of your characters as anything other than what you paint as words? If you use words, give them just enough to guide them along. Then, let them fill in their own blanks. Even if you give them minute details, a lot of readers are going to lose interest and fill in their own blanks, anyway. If you force them into some image on the cover, whether good or bad, you take away that freedom. This hazard comes with a price if your book is adapted to the movies. Once a certain star takes on the role (and this goes for side characters as well), it leaves those faces cemented in the consciousness of the readers. If the stars change from movie to movie, there can be a rebellion of sorts. Some people will stick with the original star, while others with either go with the flow, or once again, fill in the blanks. Guess what’ll happen with your book covers? There’s a pretty good bet the original covers will be replaced with revised artwork with the stars on them. Book covers without characters are quite common and are a far safer bet for you as a writer. Without a character (which includes beasts, icky bugs, monsters…whatever), you can now let the words you write drive those descriptions for the reader. You’re no longer at the mercy of an artist you have no control over to drive your impression of what your character (or icky bug) looks like. Now, it’s up to the reader to fill in their own blanks. What about the artwork, the scene or image? Now, this is a whole different realm. Especially for fantasy novels, they artwork tends to be more elaborate than other genres. It doesn’t have to be a scene from the book specifically, just the impression of something that could be from the book. Something to attract the eye. After all, that’s the whole point of the cover. To attract the eye. That’s the way it is with any cover, to attract the eye. No matter the genre, the cover needs to attract the eye. Since this style has no character or figures on it, it’s a scene, a logo, or something along those lines. Blank covers are the least interesting. Best-selling authors can get away with them better than new authors. They’re the most boring of all. Then logos, though they can be quite popular and effective. The best are scenes of some kind, and should have some relation to the story but don’t need to be a specific one in the book. Then again, if it’s a fantasy story, the scene shouldn’t be from a shopping mall! They key is the artwork, whatever is used, doesn’t look hokey or amateurish. That screams self-published. However, that doesn’t mean all self-published books have bad artwork, or that conventionally published books have great artwork. There are self-published books out there that put the big six to shame. It’s a matter of effort and how much money you want to sink into your book, if you self-publish. If conventionally published, it’s all about lucking into a great marketing and art department! Whichever way you go, keep in mind that if you get conventionally published, you have little control over the artwork so if they decide to put a character on the cover, tough! If self-published, do you really want to cement the main character in the reader’s mind or let them paint their own picture? Most people will anyway. If you do it for them, they may not like what they see and it may bias them against you or your story. It’s better to leave a little to their imagination. Speaking as a cover designer, there’s definitely pros and cons to this. We’ve done both on our covers. One of the main issues with using characters on a cover is most DIY artists are limited to using stock photography. Sure, if you’re skilled at Photoshop you can manipulate multiple images to get what you want, but since many are not at a professional level with Photoshop, the results are hit or miss. One sure way to get exactly what you want is to go through an illustrator, and for that, we’re usually talking big bucks. Scenes are easier, but even then you have to know what you’re doing. You don’t want to end up with a kitchen sink—which is to say putting every bit of a scene or symbolism on the cover. Sometimes less is more and if you pick the right symbols or the right scene, you have a shot at a cover that sells. The best thing anyone can do is go to the book store and study the covers in your genre. Look at what others are doing, how they’re doing it, which ones make you reach for that book, and then think about how you can do the same and put your unique spin on it. Whatever your path of choice turns out to be, you owe it to all the hard work you’ve put into writing your story to put just as much thought and consideration into the cover. Like I say to clients, you could have the best story in the world, but if no one is compelled to pick up your book, it’ll never get read. Deborah, That is outstanding advice! I agree. If you are self-publishing, or if conventionally, and have any input into the artwork, that’s the best advice one can give. I really appreciate the comment. You’re the best! Not related to the post, I’m sorry, but I haven’t found a better way to contact with you. I’ve found in another website one of your post mentioning your life in Eurovillas and that you couldn’t find one of your houses exactly because of the name changes. While the name now is Eurovillas, my guess is that you went into there when it was still called “Ciudad de las Américas” (City of the Americas). In this web: https://lliviaesturistica.wordpress.com/2013/06/28/2746/ you can see a very interesting post about Eurovillas history. But the best part is this image: https://lliviaesturistica.files.wordpress.com/2013/06/dsc03235.jpg that holds the names and numbers of the firsts streets of Eurovillas. The map show Eurovillas doesn’t changed a lot in this years. Hope this helps to find your house then. Thank you so much! I really appreciate the update! True, I have no page for my time in Spain, specifically. They were just stories about my life I posted on Let’s Talk Nevada which, unfortunately, has been closed down. I’ve never heard of Ciudad del las Américas! I never knew it was called that. Weird. After living there for almost ten years between 1973 and 1991, I can’t recall it ever being called that. 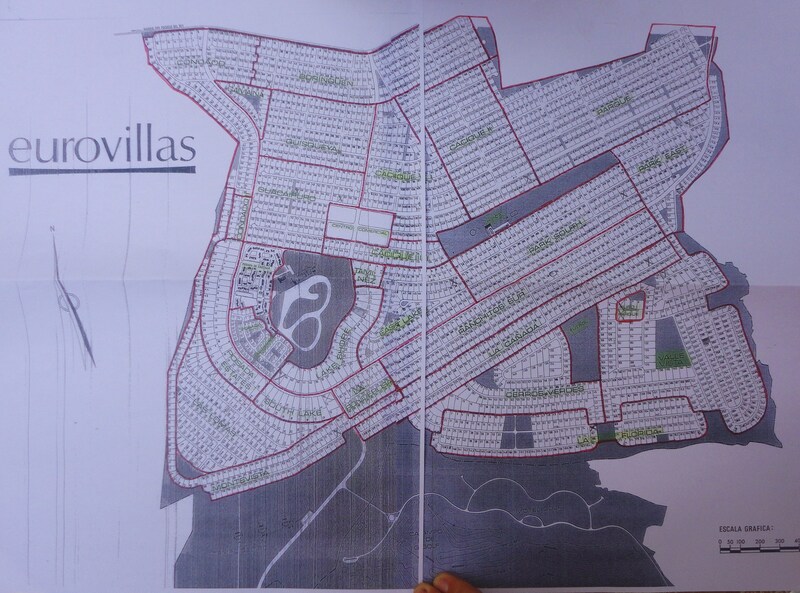 Maybe someone did, or maybe I saw it on a map somewhere, but to us and everyone we knew, it was always Erovillas. That’s cool info to know. I’ll check out those web sites later today if I get a chance.